Better Life - Valentine’s Offers. Shop exclusive deals this DSF at your nearest Better Life store Mall of the Emirates, The Springs Souk, Dalma Mall - Abu Dhabi and Deira Outlet. Offer valid till 2nd February, 2019. 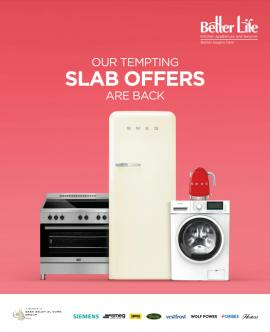 Better Life - Our Tempting Slab Offers are Back. Better Life - Summer is almost over. Our Offers aren't. Better Life - 3 Days Super Sale. Super savings on leading brands. May 10-12 only. 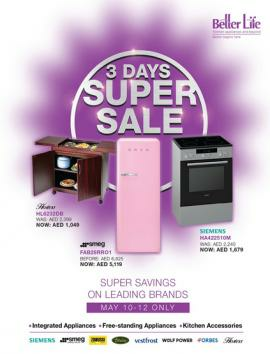 Avail the best deals at Better Life on kitchen appliances from Siemens, Zanussi, Smeg, Breville, Okka, Laurastar, Risoli & more, and get rewarded with discount vouchers of upto AED 1,500. 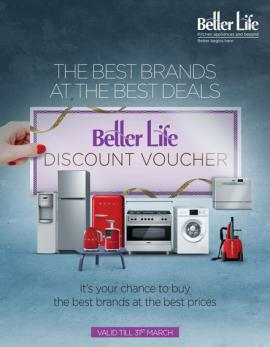 Better Life - Better Offers. Save up to 75% this DSF! Better Life - Super Sale. Up to 90% Off. 23 - 25 November. Offer valid on select products. Better Life - The more you spend the more you get. Get rewarded with Better Surprises this Dubai Summer Surprises on the world’s best kitchen appliance brands at Better Life. Better Life - Better Sale. 40% to 75% off. Limited period only. Available at the Deira outlet. Better Life - This DSF, get rewarded for spending money at Better Life. 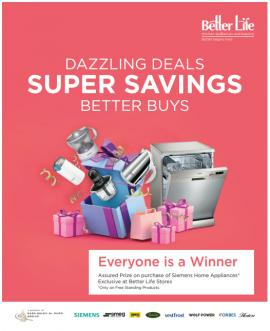 Shop for your world-class appliances and walk away with some big savings at the Big Better Life DSF Extravaganza. Better Life Appliances and Accessories is a fully owned company of the Easa Saleh Al Gurg Group LLC and is an ISO 9001:2008 certified organization. It was formally named as Better Life following the merger of appliance businesses of three ESAG divisions in 2003 – Scientechnic – Home Appliances Division, Scientechnic – Telephones Division and Al Gurg Electronics. The company operates in UAE, Oman and Saudi Arabia. Since its inception, Better Life continues its relentless pursuit to making life better and easier for everyone by being the only specialist home appliances, consumer electronics and telecom company home to the world’s best brands. 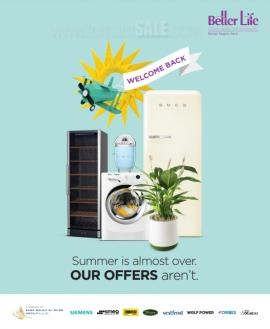 It is now a market leader carrying the widest range of built-in appliances, major domestic appliances, small appliances, air conditioners, air and water purifiers, televisions and cordless/corded telephones from a large portfolio of world-class brands including Siemens, Smeg, Zanussi, Terim, Gigaset, Grundig, Beko, Vestfrost Solutions, Forbes, Onida, TCL Small Appliances, Gefu and AEG. 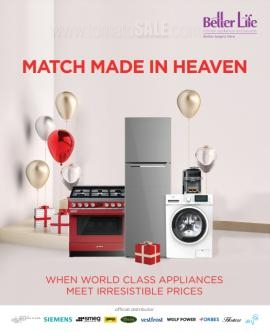 The market has also seen Better Life’s bold venture into growing their brands, Wolf Power and Euron, showcasing a range of home appliances and barbecue grills superbly competing with mainstream brands. The variety of brands carried by Better Life boasts of the world’s best in design, quality, technology, innovation and energy efficiency guaranteeing optimum delivery to every home requirement. Better Life conducts diversified businesses in its operations – Retail, Distribution and Projects divisions. Get all information about Better Life offers in Dubai, Better Life promotions, Better Life offers in Abu Dhabi, Better Life deals and promotions, Better Life Dubai offers, Electronics offers, Better Life sale and GITEX Shopper offers by browsing through TomatoSALE.